Moving may be a pain in the neck, but try not to make it a pain in the back! Too many injuries and accidents are preventable, and Few Moves Moving Company wants your move to be trouble-free and safe. Enjoy your new home instead of recuperating—follow these guidelines to reduce risk and plan a safe and happy move. Big boxes are for comforters, not books. It’s tempting to stuff boxes full, but it’s a better idea to pack each box with an eye toward lifting it. Don’t pack anything over 50 pounds—20 pounds is much better. Be kind to your back and lift with your knees for safety. Professional movers know these rules and don’t overload boxes or themselves. Few Moves Moving Company loads and carries boxes for you for a safe move and less lumbar strain. Comfortable clothes and closed shoes are critical for a safe move. Wear athletic shoes or boots with a good grip and stability. Clothes should be flexible but not so loose they catch on doorknobs, etc. Prepare your body with stretches. Stretch your back, arms and legs for a few days before the move so your back isn’t surprised by the sudden workout. 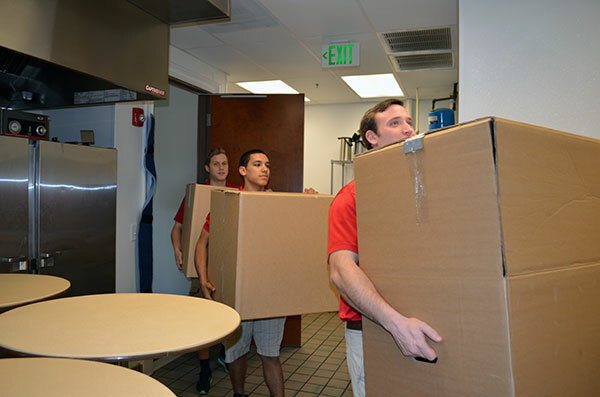 Professional movers like Few Moves staff do this too—even the movers who are used to it like to be safe! Gloves are a big help to prevent splinters and give you a good grip. Hand trucks are great for furniture and stacks of boxes. Moving straps can really help you lift a large, unwieldy object. Professional movers like Few Moves will discuss your needs before your move and even come to your house to look over your belongings and see what special equipment might be needed. One of the benefits of a moving company is that they’ve done all this before, and they know all about the easiest, safest way to move your things. Clear the path to the truck at your old and new home so there’s no tripping over tricycles. Look for obstacles like low-hanging branches and uneven paving, too, and mark them if they can’t be removed. Some floors are naturally slippery, and this can be made worse if you get rain on moving day. Mops are a help, and Few Moves Moving Company will put down floor runners and other protectors to prevent slips and any damage to your floors. Small children and pets won’t be a help on moving day, and they could get underfoot and cause an accident, injuring others or themselves. It’s best if they can be elsewhere for the day, or get a sitter on site. An emergency kit—just in case—can stay on your kitchen counter until the last box is gone. In this kit include ibuprofen, bandages, peroxide, a sports wrap, and emergency telephone numbers. Some say that having this kit on hand ensures you won’t need it. But just in case! You friends won’t stay friends long if you ask them to move an 800-pound piano. And you put people’s safety at risk by asking them to move very heavy objects. Even if you plan a do-it-yourself move, ask movers to carry appliances and heavy furniture, for the sake of your buddies and their backs. 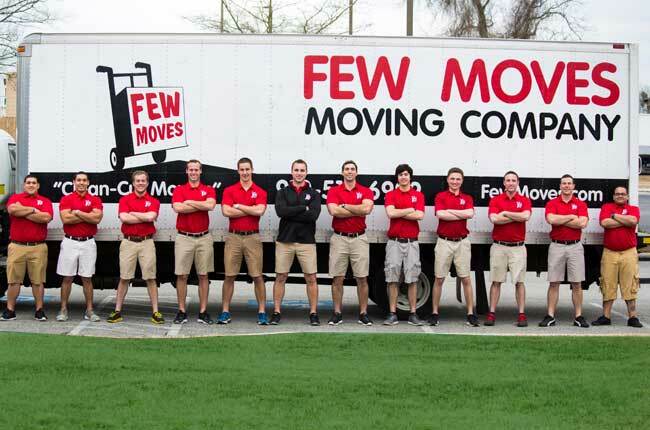 Few Moves Moving Company is a full-service moving company and can do everything from planning to packing and moving and unpacking, but we can also help you move just the heavy stuff, if that’s what you need. Give us a call and we’re glad to help. When you hire moving company, you don’t want a fly-by-night operation. You want fully-insured movers with experience who are familiar with safety practices. Few Moves Moving Company has four separate insurance policies to be sure your belongings make it to your new place in proper order. Whatever your moving needs, big or small, give Few Moves Moving Company a call at (919) 999-6201 in Raleigh, NC or (910) 512-6999 in Wilmington, NC. Or request a quote online. We’re here to help with your moving needs and make sure this move is the safest one ever!